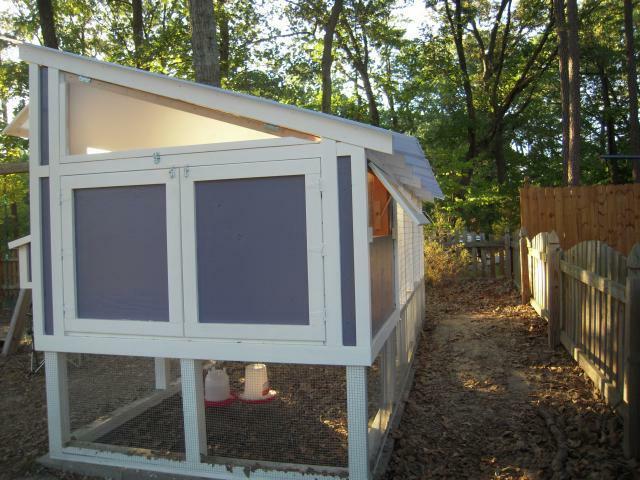 The coop is 6'x4', with the run extending an extra 12'. I'd show you plans, but my husband built it without any. (He's like that) We were lucky to have access to lots of scraps, and extras lying around, which kept our costs down. 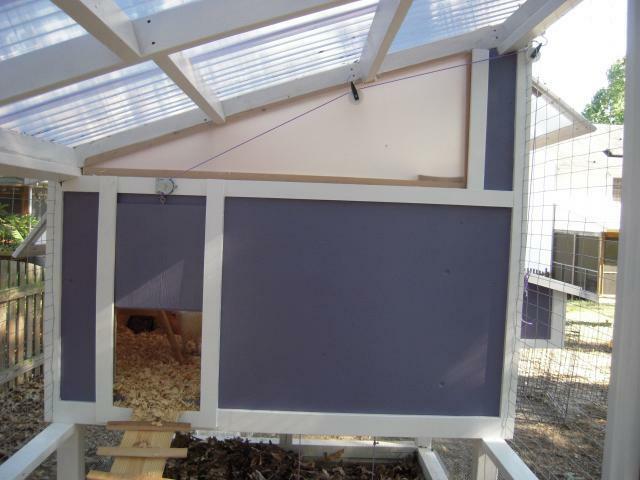 We used hardware cloth around the bottom, and on the windows of the coop, and welded wire on the top half of the run and door. The semi-opaque stuff on the windows and door is some kind of plexi-glass stuff my husband salvaged off of a construction job. The roof is Tuftex panels. * Looks nice, so as not to bother the neighbors. * A run tall enough to walk into, with a dummy proof door, so I won't lock myself in. * Large clean-out doors on the coop. * LOTS of ventilation...it can get mighty hot in the summer. * Nest box accessible from outside. This is the pulley system for the pop door. The big clean out doors. There's a removable kick board in front to keep the shavings in, and then I can take it out for cleaning. The metal food bins have feed in one, and grit in the other. They don't eat or drink much when they're in the coop overnight. The big feeder and waterer are in the run. The nest box is currently blocked off by a pizza box till they're ready to lay. The perches are free-standing so I can remove them for cleaning as well. 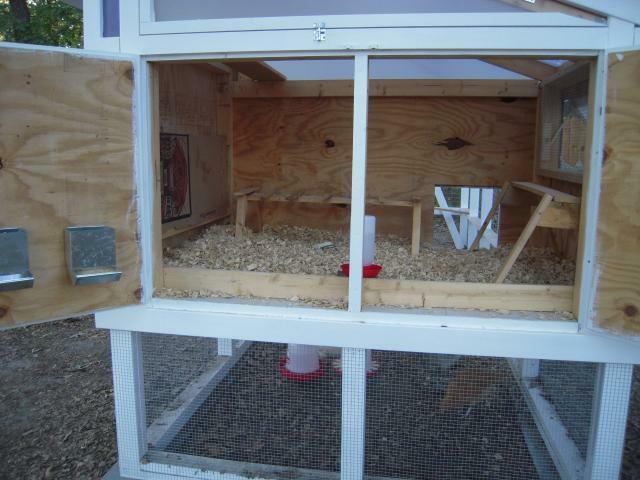 This shows the other side of the coop. The upper triangular window opens, too, but we haven't put hardware cloth over it yet. Would love to see in progress pictures since your husband didn’t use any plans. What a lovely coop and run your husband built! I like your color combination. It's a bummer for us less handy people that you don't have a plan or blue print for us to look at. I think you did a great job on making sure it is well ventilated. How many birds do you keep in there? Your husband and I must be related. Is he part Scottish by any chance? It appears we are both rather ....uhmmmm...ah....frugal. And as it also appears we are both somewhat ...ah....uhmmmm...imaginative. I will say tho' his attention to detail is much more attuned than mine....such as finishing...and painting. I made the mistake of showing my wife this and she said "That's good. (with an emphisized)'He' knows how to pull it together. Could(emphasizd) 'you' do something like that here?". If you don't mind I will be uhmm...borrowing...utilizing...? some ideas. After all it is kind of your fault I need to do some upgrades. Good job both of you. It is a nice coop and run. Beautiful coop Really like the color & all the ventilation. Great job. Great coop, I love it! That would be perfect for our FL chickens. Congrats on POW! 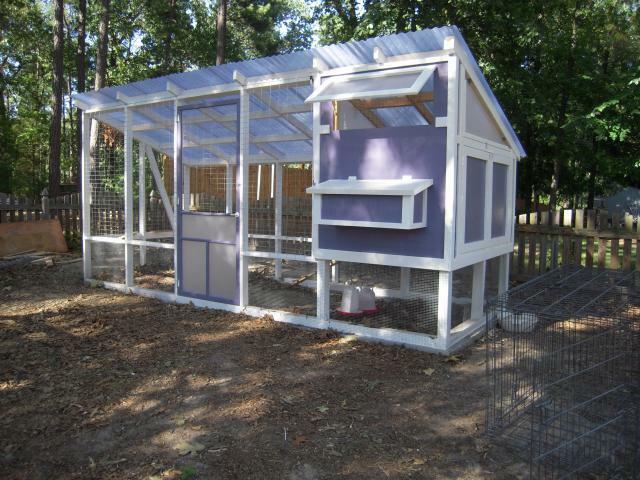 Do you have perches in the upper section (where the windows are) too? we are basically copying your coop! Hope you don't mind-it's perfect! I really like the look!! Lucky chickens!! Do you have metal feeders on the inside of the double doors? Where did you find those?